Please follow these simple steps when buying eload or epin anonymously and securely using Bitcoin (BTC), Bitcoin Cash (BCH), Litecoin (LTC), Ethereum (ETH) or Dash (DASH). Coins.ph is also accepted for peso payments. Step 1: Choose appropriate “Category”. Step 2: Choose from “Products” list. Step 3: Enter the mobile number where the load will be sent. Step 4: Click the “Add Item” button. Repeat steps 1-4 if you want to buy more products. Step 5: Click “Check Cart” button to review the list of products you are buying. Step 6: Enter your email address on the “Cart” page. All details of your order will be sent here. So, make sure to enter valid email address only. Apply your promo code if you have one. Step 7: Click “Proceed Checkout” button to see your final invoice. Step 8: Choose from available payment options displayed on the page. Click any of the icons to pay using cryptocurrency. Step 9: Send your payment to the crypto address generated. Send the exact amount indicated on the invoice excluding transaction fees. If you’ll choose coins.ph, you will be redirected to coins.ph’s payment page. Step 10: Wait for your payment to be confirmed on the blockchain. Once payment is confirmed, your order will be processed instantly. 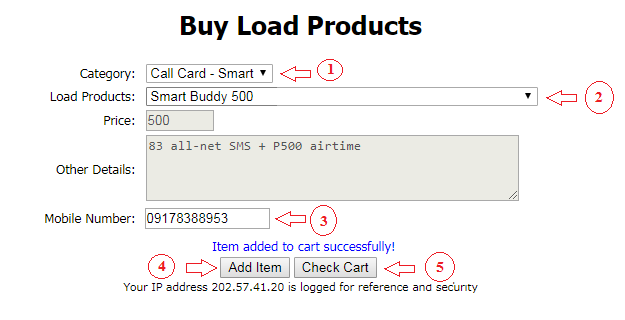 The load will be sent to your mobile number entered on Step 3. The details of your invoice will be sent to the email address entered on Step 6. Buying load has not been this easy! 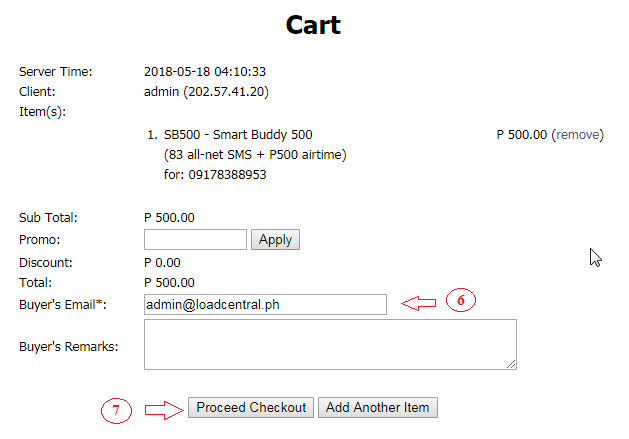 About www.loadcentral.ph: This 1-stop shop is an official partner of Uniwiz Trade Sales, Inc., the owner and developer of the LoadCentral platform that sells all kinds of load and prepaid products in the Philippines. Buying Smart load, Globe load, Sun, Talk & Text, or Touch Mobile eload has not been this easy. Now anyone online can conveniently purchase various prepaid services such as phone cards, prepaid cards, mobile eloads, call cards, gaming cards, internet cards, load cards, and cable TV subscriptions through CryptoCurrency, Paypal, and credit card. With just few mouse clicks, you will receive your load credits almost instantly. 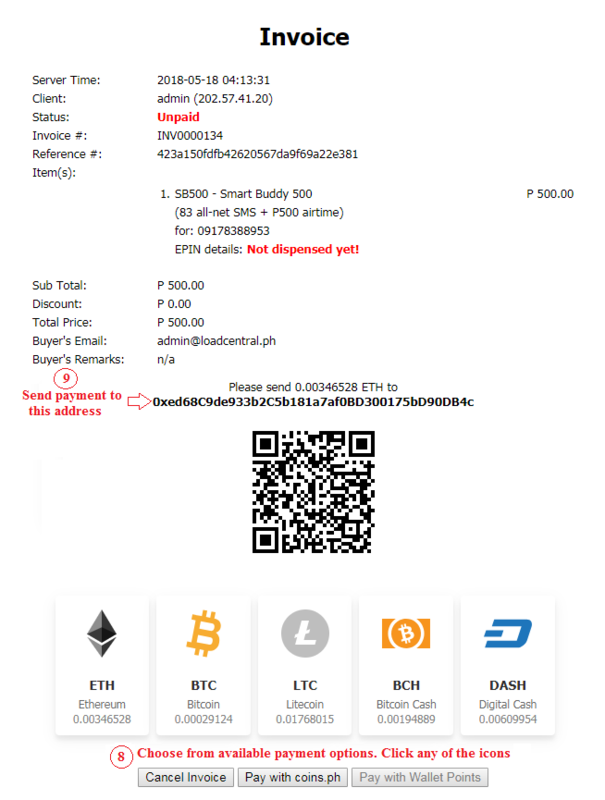 if buying load through Bitcoin (BTC), Bitcoin Cash (BCH), Litecoin (LTC), Ethereum (ETH), Dash (DASH) or coins.ph, please go here. if buying load through Paypal and credit card, please go here. Note: List of prepaid products can be downloaded here.